Mother Goose Time‘s preschool curriculum continues to be a great fit for our family. 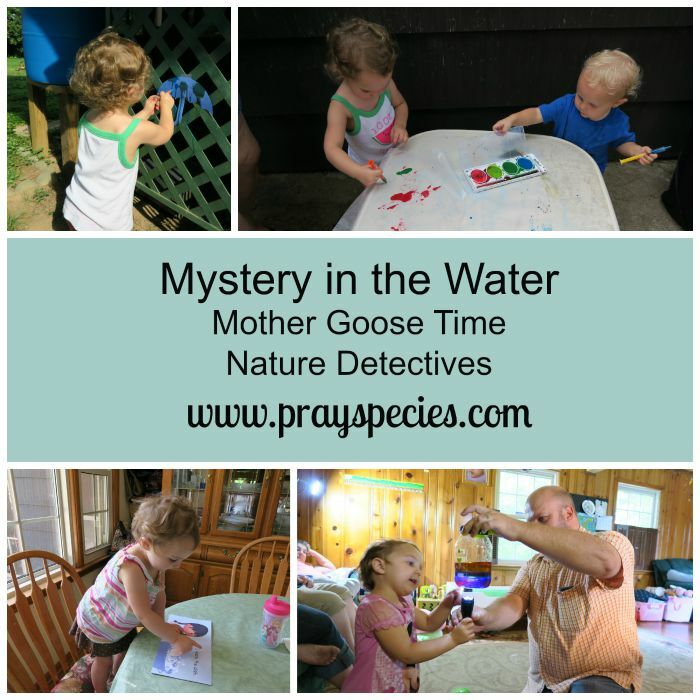 We have really enjoyed this month’s theme: Nature Detectives! We have learned about trees, air, and this week finished our unit on water. The kids had a fabulous time learning about volumes and learning how much different containers would hold. 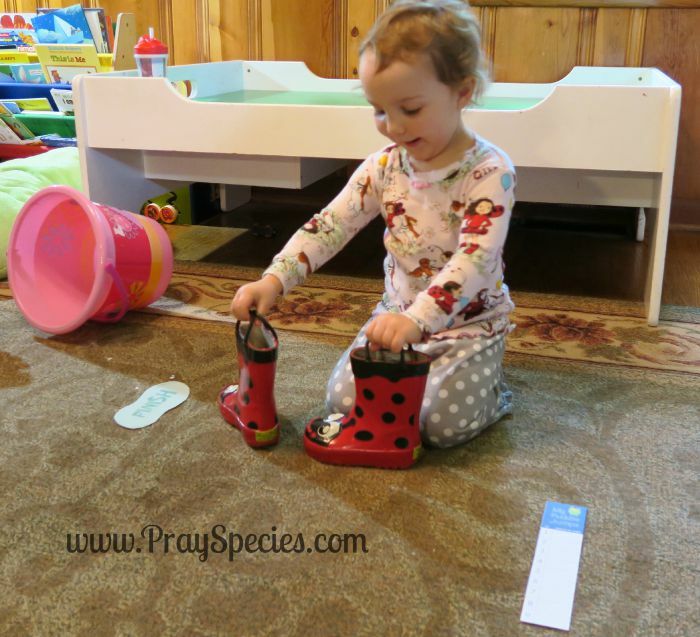 Using a set of measuring cups, Ladybug predicted then tested how many “cups” of various sizes would be needed to fill larger containers. It was fun watching her figure out that two 1/2 cups would fill one cup, etc. As an introduction to the concept of measurement, we began with a start label and then jumped a distance before putting down a finish label. 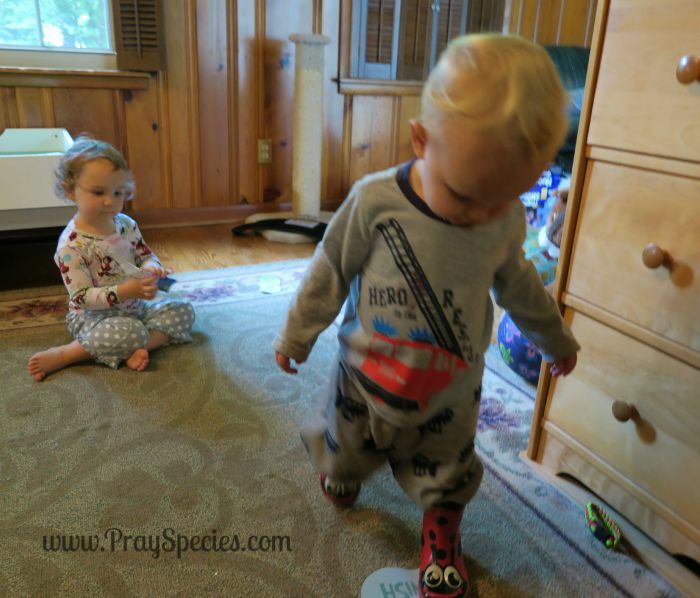 Ladybug then used her boots to measure how many steps/shoes were needed to measure the distance she had jumped. She then had her brother, Owl wear the shoes. It was fun to see how many steps it took him to complete the same distance she had jumped. With only 16 months separating them, their shoes sizes are remarkably similar and thus, the measurements were close to the same. Using a simple washer attached to a string, Ladybug experimented and compared the different depths of a variety of containers. She enjoyed this activity quite a bit. I think she may have actually measured everything with water in our backyard including the birdbath. Both kids loved this fine motor activity. They identified a variety of foam shapes by name, mixed them in the water, and then “went fishing” for them using a forceps or tweezers. We played this game several times. 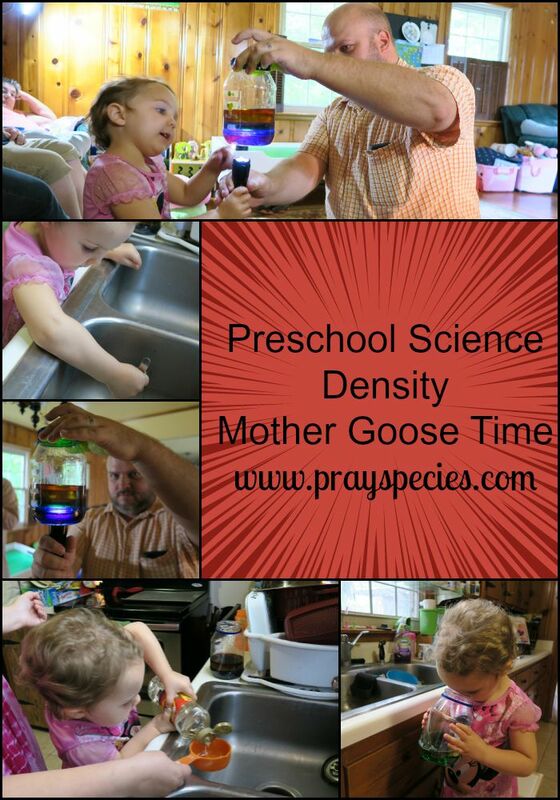 The kids also loved this early introduction to the concept of density. 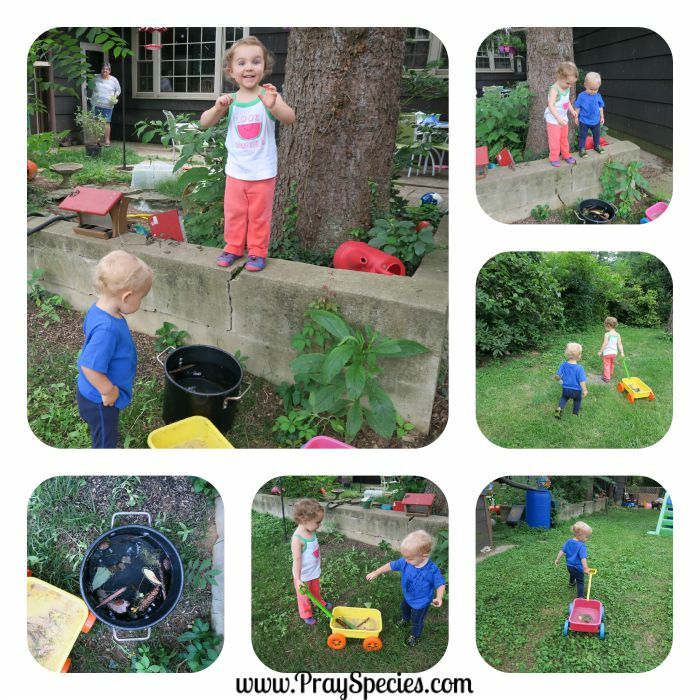 They called it making “backyard soup.” Ladybug climbed up on our cement garden wall and dropped in several items from the backyard including pine cones, rocks, flowers, sticks, grape vines, and leaves. 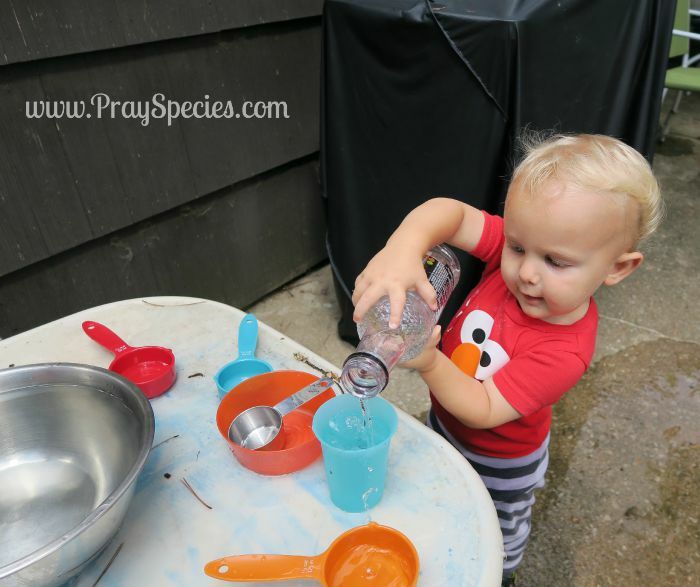 They had as much fun collecting the items as they did depositing them into the pot of water. They very quickly caught onto the experimental component of this activity and were quick to guess whether the item would float or sink. 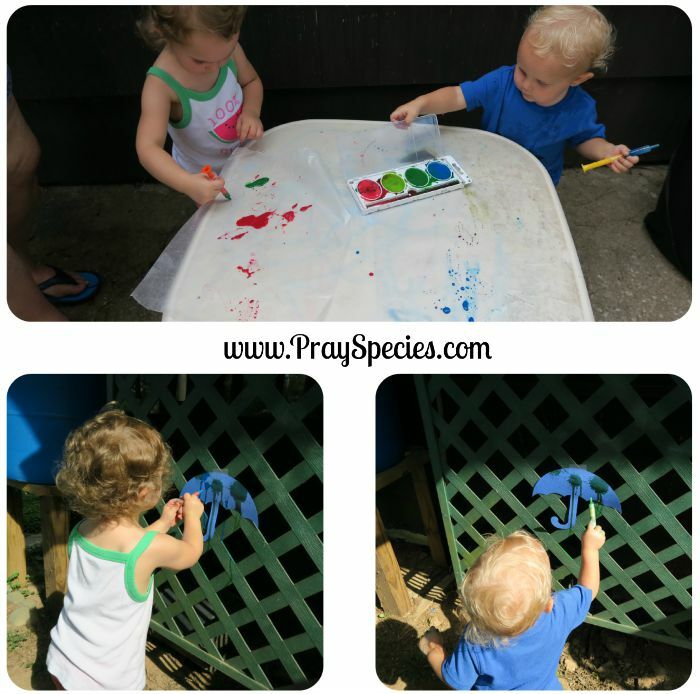 Both kids love to paint and were thrilled to have a chance to play with some water colors. 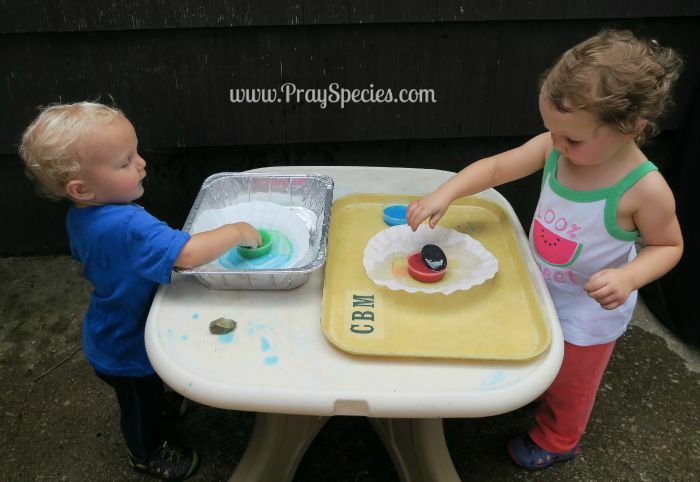 We spread some wax paper over their outdoor table and let them “paint” the paper using leftover medicine syringes. In the interest of full disclosure, eyedroppers were included for this project, but I managed to misplace them on the way outside, so the leftover syringes were a fun substitute. We used the same syringes to paint our paper umbrellas. The water unit included a small book for the kids to work on sight words. 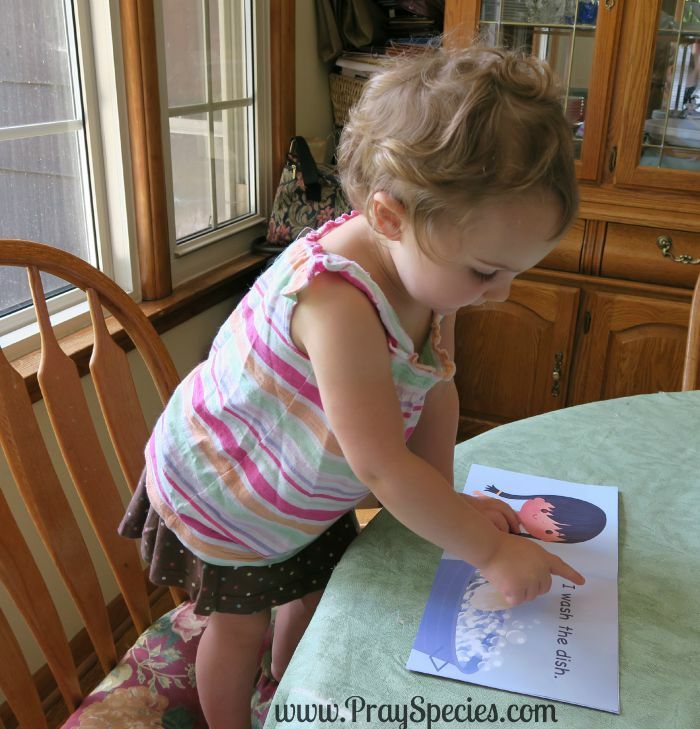 Ladybug enjoyed this book immensely and “read” it several times at the table. She did very well recognizing the key words identified on the back of the book. A card game let the kids choose which of two choices they would like to select. 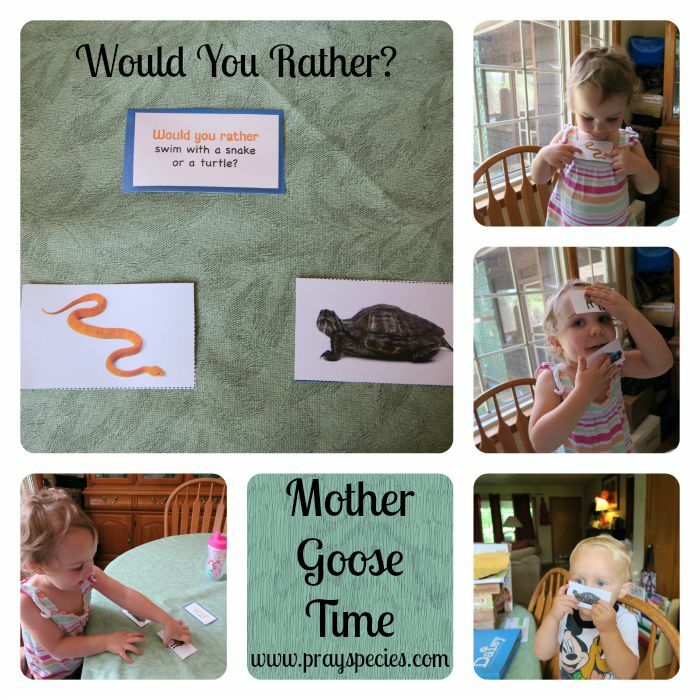 For instance, one card asked, “Would you rather swim with a snake or a turtle?” The kids found this game hilarious and very much enjoyed racing to pick their card first. We did some more painting using a “splash” technique. Rocks were dropped into small containers of paint to create a mosaic of color on underlying coffee filters. 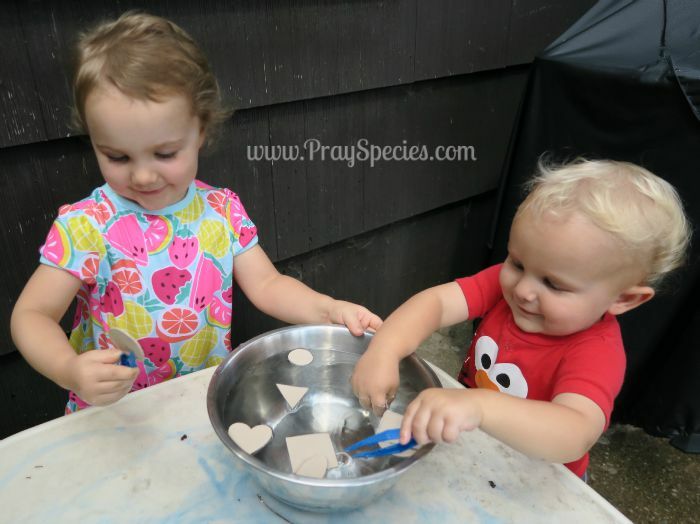 My little ones tried rocks, pine cones, sticks, etc. 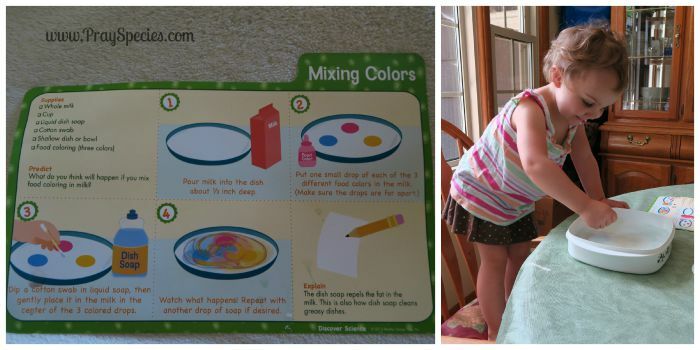 Ladybug really enjoyed the “mixing colors” experiment. In this simple activity, dish soap is added to a shallow dish of whole milk with small drops of food coloring. The detergent repels the fat in the milk causing the colors to move and swirl. 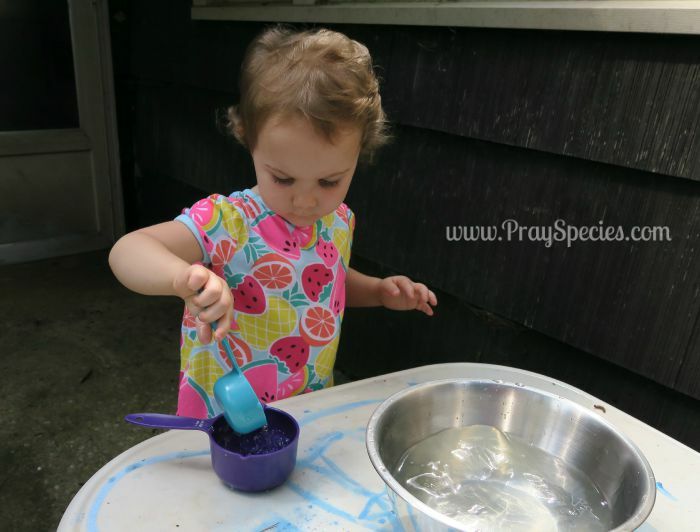 Ladybug’s absolute favorite activity was this simple and colorful experiment that helps preschoolers begin to understand the concept of density with a variety of liquids. Red (rubbing alcohol), yellow (olive oil), green (water), blue (dish soap), and purple (corn syrup) combined to create this fun liquid rainbow. She loved making this jar of colors and showing it to her Daddy who lit up the container with a flashlight to make it even easier for Ladybug to show him the different layers/colors.